Finds of small artifacts can shed light on activities, interests, and materials used in daily life. The Ban Chiang excavations produced many artifacts of stone (adzes. 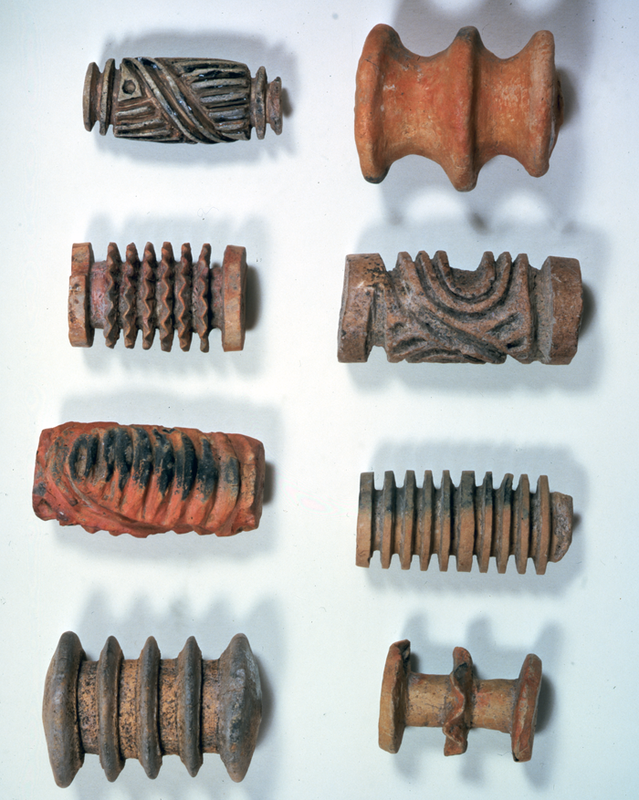 bangles, and molds), bone (bangles, beads, and awls), clay (spoons, pestles, pellets for shooting small animals with a pellet bow, figurines, bangles, spindle whorls, small cups, and the enigmatic rollers), and glass (beads). 1. Upper: BC 2018/905 bone hair pin; Lower: BC 2026/1032 bone spear point. Middle Period? 2. Left: BC 2025/1032 antler; Right: BC 2024/1032 tiger teeth from the burial of a forty-year-old male (BC Burial 20). Middle Period? 3. BC 2103/1203, clay pellets from (BC Burial 23), the grave of a 50-year-old male. Early Period. A variety of rollers from Ban Chiang. The center image is a “roll-out” experiment on sand to visualize the pattern made by the roller. 1. Worked bone 2. Spindle whorls 3. Clay figurines 4. Stone adzes. 1. Clay pestle 2. Clay bangle 3. Clay spoon 4. Clay figurine 5. Worked bone bangle.